This cozy Gulf front cottage is located off of Fort Morgan Road. So come splash in the water, play on the beach or sit and enjoy the beautiful view from the deck. This is no condominium! 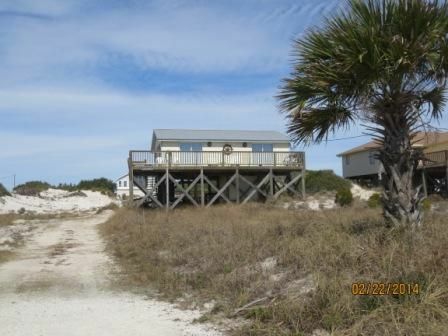 This secluded cottage is located approximately 150 yards from the western edge of the Bon Secour National Wildlife refuge. Situated just a few miles from historic Fort Morgan where you can spend the day immersed in history near the bay where Admiral Farragut declared 'Damn the torpedoes, full speed ahead!' Enjoy a ferry ride to Dauphin Island and visit Fort Gaines or the Dauphin Island Sea Lab. There is great fishing in the Gulf of Mexico with a full service marina just a few miles away. If golf is your game there are many approved golf courses in the area. Travel a few miles east to Gulf Shores and visit Waterville, or The Zoo (featured in the Animal Planet series 'The Little Zoo That Could', the Hangout and the Wharf. It you like to shop there are numerous local shops in Gulf Shores or travel to Foley and visit the Tanger Outlet Mall and the newly opened OWA (which means "Big Water) amusement park, with shopping and dining. There are also several golf courses and marinas in the area. You can also find transportation to the casinos of Mississippi and Louisiana. The cottage has been updated with new living room furniture and new carpet in the bedrooms. The master bedroom has a king size bed and a sleeper sofa that sleeps two. The second bedroom has a double bed that sleeps two and the living room has a queen sleeper sofa with an upgraded mattress that sleeps two. Amenities: All linens, towels and pillows are provided. The kitchen is completely stocked with pot/pans, baking pans, silverware, utensils, coffee maker and microwave. There is a full size washer and dryer in the storage closet downstairs. The deck is the width of the house and is perfect for enjoying the breathtaking sunrises and sunsets! We also have cable television with approximately 45 channels (and growing), wireless internet and a new stereo. Please email for more details and reservations. Downstairs private enclosed outdoor shower . Located across a small private driveway from a wide expanse of quiet beach. This cottage is very private, cozy, pet friendly and non smoking! Walk onto the front deck & see the beautiful white pristine beaches on the Gulf of Mexico about 200 yards from your front door. Ft. Morgan area is very 'protected' because the Bon Secour National Wildlife Refuge is located (literally) right by the house. There are walking & biking trails within walking distance of the cottage. This area is beautiful & free from high rise hotels & other 'city' life that creates noise & light pollution. See the beautiful stars at night because it's so dark, also see the dolphins jumping in the morning because it's a common occurrence at your front door. This cottage has many return renters Come to Ft. Morgan & stay in our cozy little cottage, Pair O Dice! Email me for questions! The cottage was clean and cozy, and the location could not be beat! We enjoyed every minute of our stay at Pair O Dice and hope to be back soon! Perfect for a small family. Super easy beach access. Quiet and relaxing location. Thank you for your review. I am so glad you enjoyed your visit and that it was quiet and relaxing. Please come back again. This was the best beach cottage on the Gulf Of Mexico we have ever stayed in. The house was built in the 40's, and it felt like going back in time. Despite this, it was incredibly well stocked, and even included an immersion blender! The walkway to the beach was mere feet from the door, and the Bon Secour Wildlife refuge was just down the beach, 150 yards way was NO development, just sand dunes and pure, pristine beach.It was like a different era. We booked at the last minute and the owner could not have been more helpful, we very much hope to return again next year! We are so glad you enjoyed your visit and that we could work out the details for the last minute rental. We try to keep the cottage updated and comfortable. The location is a blessing. Thank you for being considerate guests and we look forward to you coming back. Cute small cottage. Great weekend getaway stay! It was wonderful for me and my children to share some quality time together, with our dogs. Pair o dice was located just steps from the beach, and offered amazing views from the front deck. Our dogs absolutely loved the beach, and it was wonderful to be able to bring them with us. The house was well equipped, and clean. Our only complaint would be that the air conditioning seemed to have a mind of its own. It would get quite warm in the house, during the day, regardless of what we had the thermostat set at. Thankfully the AC would kick in during the evening, so sleeping was comfortable. The location was perfect. We had a great time! This quaint cottage is located away from the hustle and bustle but be sure to check out the local golf courses, marinas, restaurants, water/amusement parks, Fort Morgan, The Zoo and the Bon Secour National Wildlife Refuge.